Inspired by a painting done of me and for me by my good friend and artist, Len Schmidt, a while back I carved a trout out of pine, in high relief. The idea was to test out several artistic concepts. I wanted it to be a minimalist type of carving – no scales, just a hint at the eyes and gills – but I also wanted it to give the impression of a fish that is half-in and half-out of the water, and one that clearly has some movement going on. It hang on my wall straight up and down for about a year, and I wasn’t happy with it. 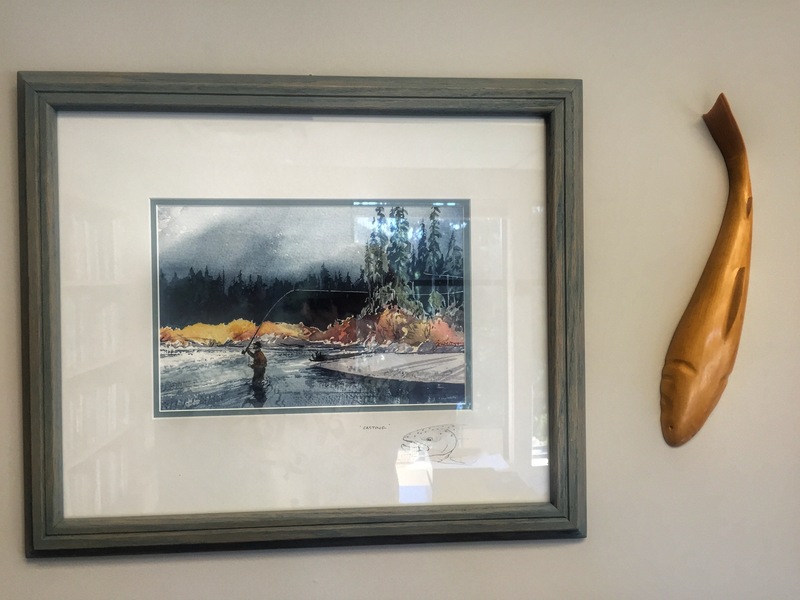 Then, recently I thought about grouping some of the art I have on my office walls, and I decided to put this carving next the painting that inspired it. I also decided to hang it at an angle to create more visual interest. The twist of the tail and the curve of the tail fin show so much more like this. I like it a lot better! I’m still not particularly happy with the carving overall, but I’ll chalk it up to experimentation and learning. As a result, it’s not for sale. Someday I’ll redo it and resolve the issues I have with it and then I’ll consider selling it. Until then, I hope you can enjoy it for what it is.